In Alyssa’s science lesson today, they learned all about the Periodic Table. Full marks to the teacher, because he played them American mathematician-singer-songwriter-satirist Tom Lehrer’s fabulous 'The Elements Song'... which is basically him singing all the names of the elements to the strains of Gilbert & Sullivan, recorded sometime in the 1950s. 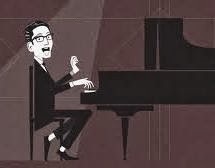 I have it – and many other great songs like 'Poisoning Pigeons in the Park', 'Oedipus Rex' and 'The Masochism Tango' – on an illegally copied cassette, An Evening Wasted with Tom Lehrer. To be honest, I thought he was dead. But no, he’s 85 and still very much alive. Alyssa then informed me that Daniel Radcliffe is a huge fan (“the cleverest and funniest man of the 20th century”) and together we watched a YouTube snippet of him doing The Elements Song on Graham Norton.